All my time running I’ve loved the way that it’s made me feel, made my body look (well except for when a little too undernourished!) and the good that I know it is doing for my health. I’ve also had to deal with the comments from friends and family on how it’s bad for my knees, will wear out my heart and the tales of people who die whilst running. The recent example is two people who died last week in the Guangzhou Marathon in China, one of which was running a 5 kilometre event, while there was major international coverage after the death of 30 year old Claire Squires in this year’s London Marathon. Well that debate looks like not disappearing any time with the publication of a report and subsequent article in the British newspaper The Daily Telegraph about the health risks of marathoning. The article, titled ‘Too many marathons can kill, warn doctors’ essentially claims that too much sustained exercise can lead to “overstretching of the organ’s chambers, thickening of its walls, changes to electrical signalling, accelerated aging in the heart, diastolic ventricular dysfunction and large-artery wall stiffening”. 30yo Claire Squires died in the 2012 London Marathon. It was later revealed she had an irregular heartbeat. To me this is ridiculous. The claim is essentially that there is more damage to the heart by running than there is listed by the Heart Foundation on how smoking damages the heart. There is also more damage done to the heart by running than by being obese. This really, really scares me as I reckon people will use this as an excuse to not exercise. I’m not saying that the science is fraudulent. I do reckon though that the sample they are looking at is miniscule and similarly the number of people who die each year running a marathon as a percentage of entrants is tiny. 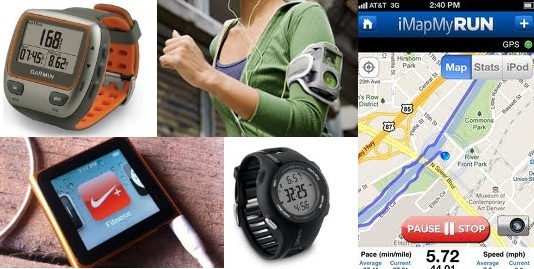 I could just easily scan the entrants list of an Ironman or marathon race and find people racing well into their 80’s. Just like everything in life, training for marathons and running needs to be done in moderation, but there needs to be caution in over exaggerating the risks to the masses of something that is relevant to a very small number. I was reading an article online from the UAE-based Khaleej Times called ‘Long-distance runners lap up miles for the love of it’ that analysed why people run, especially marathons, and what sort of personalities are drawn to running marathons. American sports psychologist Gregory Chertok was attributed in the article as saying ‘long-distance running seems to be appreciated by those who enjoy solitude – or periods of solitude – and are OK with monotony’. During my running life I certainly enjoy the time alone that running brings me, to either gather my thoughts, think through issues or on a really good day think of absolutely nothing at all and just get lost in the run! It was interesting to note that a 2007 published scientific study (The psychology of the marathoner: Of one mind and many, John Raglin) seemed to contradict this ‘solitude’ approach, claiming that marathoners ‘are generally less introverted than non-athletes and possess more desirable mental health profiles, scoring lower in depression, anxiety and neuroticism, and higher in desirable variables such as emotional stability and psychic vigor’. It was also noted though the act of running marathons is not a cause of these factors, but rather that these personality traits make it more likely for these people to be pre-disposed to an attraction to the challenge of marathons. I largely run by myself due to the fact that it gives me greater flexibility to run when I can as work or family commitments can make it hard to run only at set times. I know though for a lot people the community and comraderie from a running club is what makes the sport so enjoyable. I do enjoy the times when I get to run with my brother or a friend so can definitely see the appeal of both group running or running alone. To run a marathon though I think does certainly take an element of selfishness in order to meet the commitment required. I know my personality type using Jung typology is very much more aligned to been an extrovert in certain settings such as work or with friends, but my preferred default personality is to be slightly introverted, not in a shy way, but more that I am comfortable with my own company. For me, I think my personality certainly plays a part in why I run and the enjoyment that I get from not just racing but also the training and even the analysis of all the associated data such as mileage, heart rates, pace, etc. 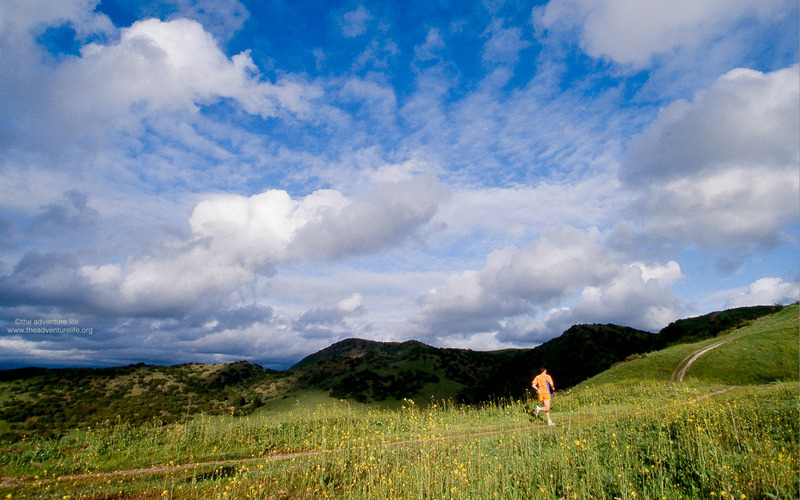 Do you prefer to run by yourself or in a group? Do you think your personality attracts you to running? Finished a marathon lately? Then apart from the buzz of completing the distance, maybe recording a PB and having a happy snap to share with friends, you will undoubtedly have received a finisher’s medal. The question then becomes one of what to do with said medal after the race. For me personally it’s always just been put in a box on a shelf in my study and occasionally I’ll also keep my race bib and write my time on the back of that as a memento of my performance. Others I know have them framed or hang them all together and then others again give to their kids to play with, throw them in a sports bag or get rid of them all together. I’m a fan of the medal as a way to recognise the achievement of completing a marathon and remembering a particular event. I’m sure that some purists would argue though that the awarding of finishers medals has contributed to the mass participation/’finishers’ mindset as opposed to the days when marathons were raced. This point is pushed even further with medals awarded nowadays in some cases with races as short as 5km. I doubt that people would choose to race a marathon, or even one event over another, because of the medal but if for some people that encourages them to run then I say go for it. I think the marathon is such a significant event in terms of effort, training and commitment that it deserves recognition and a medal is entrenched as a way of doing that. For elite races and to recognise place getters there are still trophies, prize money and other efforts to reward high achievers, but I don’t feel that the awarding of a finisher’s medal undermines the achievements of those who win. 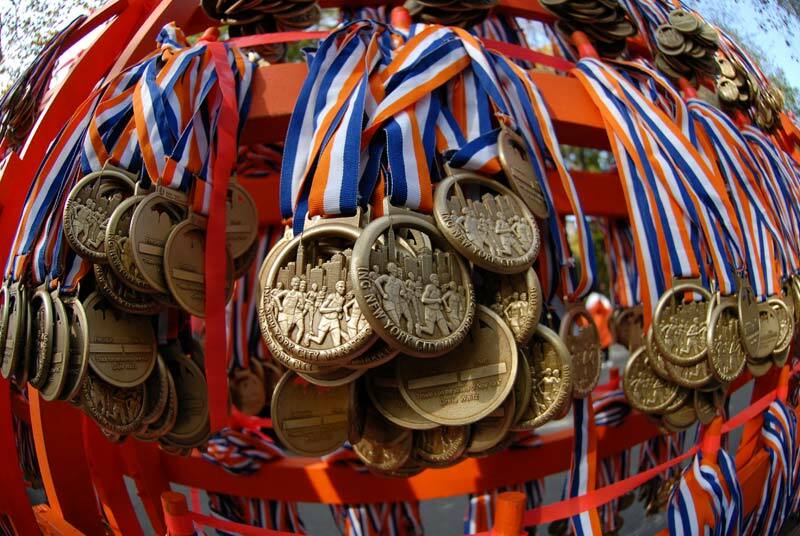 What do you think of finisher’s medals? What do you do with yours? I used to love heading to the beach after work, meeting some friends and going for a nice hour long run along the coast and then grab a coffee – or more likely a beer or three! Slowly as I got older the responsibilities of life grew with me; work got longer, I wanted to spend more time with my wife (a non-runner, but that’s another whole post!) and then the daddy of them all – I became a father. I’m pretty confident that I’m not the first runner to ever have a baby and I thought I knew what to expect when they came along. I was wrong. I love my daughter more than anything in the world but they certainly change your life. It’s no longer good enough to get home whenever I get home, to go for a long run and not be sure when I’m returning or to expect to be able to have the afternoon off on a weekend to recover after my 30km training run. But I have ran more in the year since my daughter was born than almost ever before. I have finished two marathons, completed a triathlon season and ran more regularly. I did this not because of my daughter, but because I started to think about how important running was to me and that because I couldn’t take it for granted I had to plan it out and think about how to maximise my time for training. My first tip is to identify the time that works in with your child’s routine. For me, this meant becoming a morning runner. For those fortunate enough to already be early risers, this may be a no brainer, but I was always an evening runner after work. 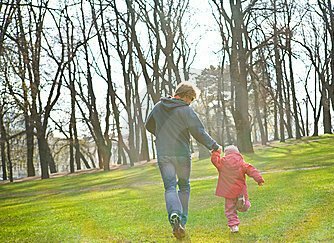 That time for me when my daughter was at her worst and if I had even contemplated leaving the house to run so my wife could face that time alone, I had better have packed a sleeping bag with me! But in switching to a morning runner the only person I was inconveniencing was me. My daughter was still asleep and more importantly, so was my wife. Next tip was to be flexible. I used to keep to a strict schedule and felt bad if I missed a planned run. Now I roll with the punches. It doesn’t mean abandoning sessions willy-nilly, but if I have to miss a session because I have father duties, then so be it and I don’t try to make that up but just ensure I can find a way to work in my next session. My third tip may not be suited or available to everyone, but I purchased a treadmill from ebay which was really helpful, especially in the first six to eight months when naps were more regular. 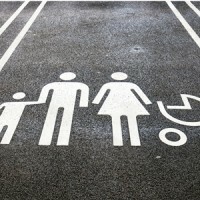 It meant that on a weekend or even a weeknight, I could let my wife relax, put our daughter to bed and then take the baby monitor with me to the treadmill, get in a session and know that if my daughter stirred or started to cry I was only in the other room and able to respond to her, rather than be miles away and leaving her with my wife. This meant some runs were shorter than I had planned and I’d much rather be on the road than the tready, but it also meant I was getting in a run that I otherwise wouldn’t have got without stretching my relationship with my wife. Look for ways to incorporate runs into your other opportunities. I occasionally run to or from work which adds a little bit of time to my trip home or back, but also means that I am getting more running into my schedule than I would if I travelled home and then ran. Talk to your partner about what your running means to you as I found that as important as having a happy child is, it’s just as important that your child has two happy parents. Running was my avenue to relax and have some me time and my wife respected this but I also respected that I needed to be responsible in my running. One thing to be prepared for is the fact that you may very well not have the usual time or opportunity to recover after a session. I always found after a two or three hour run I’d have a pretty relaxed afternoon – now I feel that I have left my wife alone for that time to tend to our daughter so it is a bit unfair to expect her to do so for the rest of the day while I recover. All it means is to have the expectation that you may be more tired than usual and that you really need to ensure that any sessions you do the day after a hard session is really, really easy. Finally, I’ve seen a lot of baby jogger prams around but I have yet to incorporate one into my running. Our paediatrician advised that they really shouldn’t be used on children under one year of age and I’m not sure how tolerant my daughter would now be of sitting in one for the whole time while I ran and pushed her. But if it works for you, go for it. The best lesson that I have learnt in becoming a dad is that what works for one person may not work for you, in fact what has worked for you before may not even work for you again, so be flexible and do the best that you can. 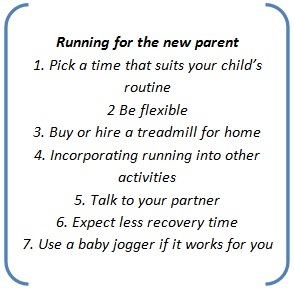 Have you got any tips to help new parents keep running? What worked for you or your friends? 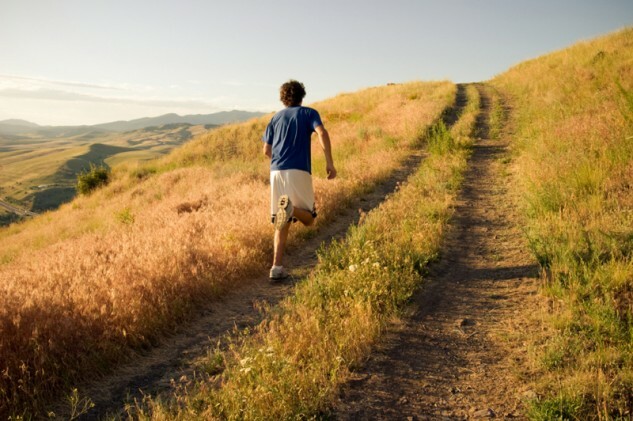 Anyone training for a marathon will have come across hill repetitions somewhere in their training program. For me, it is one of my favourite marathon training sessions and one that I know can leave me feeling exhausted but as strong as an ox. It’s important to remember that a hill session is not necessarily a hill repetition; gentle rolling hill runs or sprinting up hills encountered on a training run all provide running value, but for me the pick of hill sessions is definitely hill reps. My session of choice is 15 repeats of 300m hill sprints with easy jog back down for recovery, preceded and followed by a 10-15min easy jog warm up and cool down. The benefits of hill repeats include the physical benefits of quicker and longer leg strides, improved leg strength, increased cadence or stride frequency, increased VO2 max and higher anaerobic and lactate thresholds as well as the psychological benefit that comes from knowing hills are no problem. If your marathon in on a pancake flat course, the strength benefits of hill training and hill reps in particular will still carry through so it is recommended as a part of a structured training program. It is important to remember though that while hillwork is sometimes called speedwork in disguise, there is still a need to incorporate standard speedwork as well as the best way to run fast in a race is to run faster in training. For me I’m lucky enough to be able to do this in the Melbourne running mecca known as The Tan, which has an iconic hill called Anderson St which just so happens to be a perfect distance from my gym to do my warm-up and cooldown there and back. I find it important to start off so that I feel a slight effort but with plenty in reserve, because I want to be able to hold the same time for each hill repeat on my first as I do on my thirteenth or fourteenth time. After reaching the top I jog comfortably back to the bottom, focusing on form on the downhill but certainly not worrying about pace other than not stopping or walking – always running! 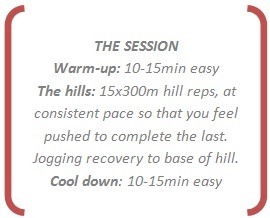 What is your favourite hill session? 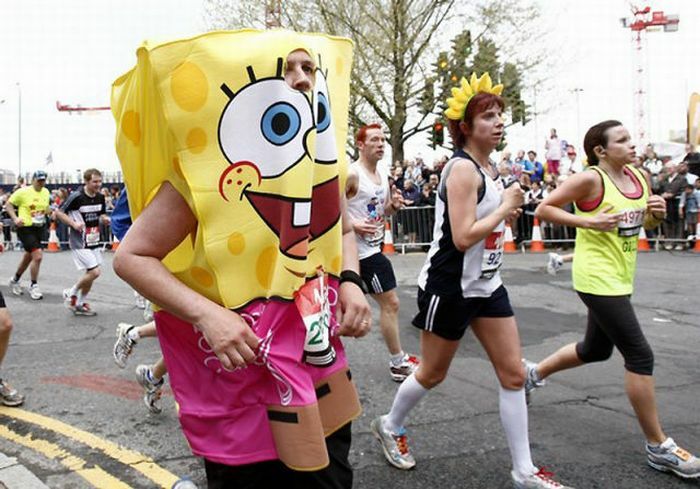 Marathons in costumes: good or bad? Personally I find running a marathon hard enough in a pair of shorts, singlet and a trusty pair of shoes. I try to stick to myself, find my rhythm and run the best race I can. If you have seen a mass participation marathon lately though you can clearly see that others have a different opinion and run to really bring fun to others, attention to themselves and some colour to races when they run in costumes. From superheroes to sports stars, surgeons to celebrities, the extent of the costumes appear to be limited only by imagination. Personally I have seen Superman and Wonder Woman, a man dressed in a bride’s gown, a number of fairies, a baby, a squadron of storm troopers and a devil while overseas fame has been achieved by people ‘running’ as a deep sea diver, a gorilla, a camel, a sumo wrestler, running on stilts, dressed as a banana, tiger, lion, Spiderman and Batman and of course Santa Claus! The reasons behind why people wear costumes in race seem to fall under two categories; to help raise money for a charity or for the attention that such an outfit naturally brings. Comments on the Let’s Run and Cool Running forums on running in costumes are generally supportive and include “I can highly recommend running in costume- it’s a hoot. For me I found that people cheered, waved, high fived, offered drinks and young women occasionally displayed interest”. Not all runners share the same enthusiasm though. Marathon aficionado Toni Reavis asks the question ‘Is it really road racing anymore?’ in a blog that questions whether stunts like costumes have undermined the competition and elite level of marathoning. I can certainly concede that the natural attention from the media that costumes draws does distract from the achievements of the elite in the mainstream media, however the counterargument would be that what level of media interest would there be if the focus was purely on the elites. The human interest and common man angle is something that allows mainstream media to connect with marathons in a time when the dominance by the Africans means that for most Western media cannot not otherwise build a story. The debate will continue as to the appropriateness, but it should also be noted that just because these entrants are in costumes does not mean they are not running respectable times. Races of note while dressed in costume include Adam Campbell running the fastest marathon dressed in a suit (2:35:53, 2012), Michael Wardian running fastest in a superhero costume (2:34:56, 2011), Kevin Harvey in a nurse’s uniform (2:51:37, 2012), Michael Brigham as a baby (3:11:53, 2012) and Naomi Garrick in a wedding dress (3:41:40, 2012). 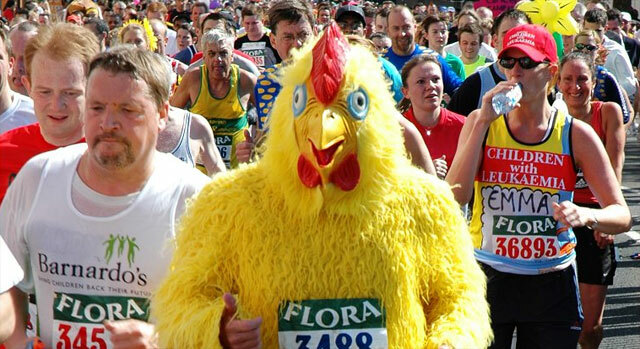 Have you ever ran a marathon in a costume? Do you think they add to or detract from an event? Russian marathoner Liliya Shobukhova turns 35 today (13 November). Marathon Intervals took a look at the life of the second fastest woman to ever run 26.2 miles. Liliya Shobukhova has not had what could be described as a standard entrance to the world of marathon running. She grew up in the rural Russian town of Beloretsk in the 1990’s her family facing extreme poverty, the winter temperatures getting as low as -25 and the nearest indoor track more than 100km from her house. As a child her ambitions were more focused on ice skating than on running. Having been convinced to join her local running club as a nine-year-old, she raced predominantly shorter distances as a sprinter and then building up to become a 1500m and 3000m runner, setting personal bests for both in 2004 (4:03.78/8:34.85). In 2007 she started running longer, winning the Prague Half Marathon and competing at the IAAF World Road Running Championships. After representing Russia in the 5000m at the 2008 Beijing Olympics, Shobukhova made the jump to the marathon, coming third in the 2009 London Marathon in 2:24:24. From there she had a golden run, winning three Chicago Marathons (2009/10/11), the 2010 London Marathon and placing second in London in 2011. 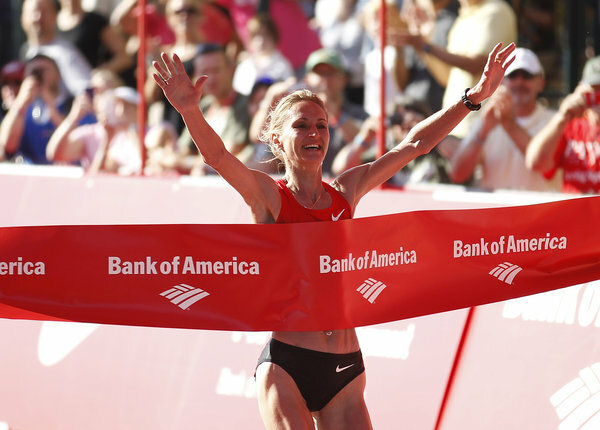 She ran the 2011 Chicago Marathon in 2:18:20, the fourth fastest time by a female ever and the second fastest woman as the three other times were recorded by Paula Radcliffe. Shobukhova sadly could not continue her form through to the London Olympics, withdrawing with injury just over halfway through. She ran the 2012 Chicago Marathon but could not defend for a fourth title, finishing fourth in 2:22:59, 56 seconds behind Ethiopia’s Atsede Baysa. Shobukhova has had to deal with personal tragedy with the death of her first husband, however is now re-married and has a daughter, along with five cats, a dog and a parrot! 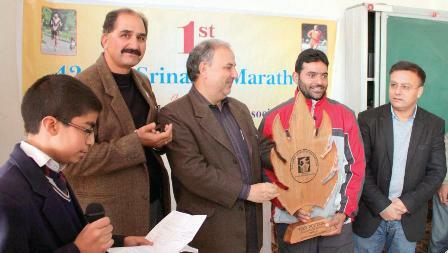 Srinagar, known for its lakes and hills, held its inaugural marathon. In a region of the world known predominantly for its military tensions between India and Pakistan, the power of marathoning showed threw yet again with the running of the inaugural Srinagar Marathon in the Indian administered but disputed state of Kashmir on 10 November. Reyaz Ahmad, a member of the local police force, won the event, finishing in 2:43.00 and the entire field of 12 runners all completed the 42km course in less than 3 hours so this was no parade. While this is clearly not a world beating time, it is impressive when you consider all runners finished sub-3:00 on hilly terrain in the Kashmir Valley and in challenging conditions, with the race starting in sub-zero freezing temperatures. I know from reading stories from marathon runners in the 1970’s, especially in the US, events back then were not the mass participation events that we see today but rather real races with small fields of genuine athletes pushing themselves and going for good times – where the mindset really was if you didn’t finish in under 3 hours you weren’t running! While I am glad that mindset has changed as I struggle through my 42km races and aim for 3:30, . I can’t help but think that this race would resonate with those runners! I don’t think the event is likely to challenge to become the next World Marathon Major, as the race has no website, there is no timing chips and in fact entrants times are rounded to the nearest minute, but it is amazing to see the reach marathons have and to consider this is held in one of the most treacherous parts of the world. 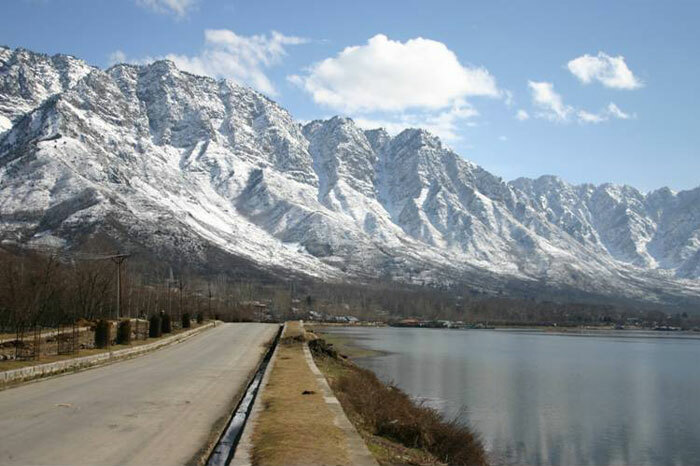 Srinagar is the Indian summer capital of the Kashmir region and is a heavily militarized city of slightly more than one million people. 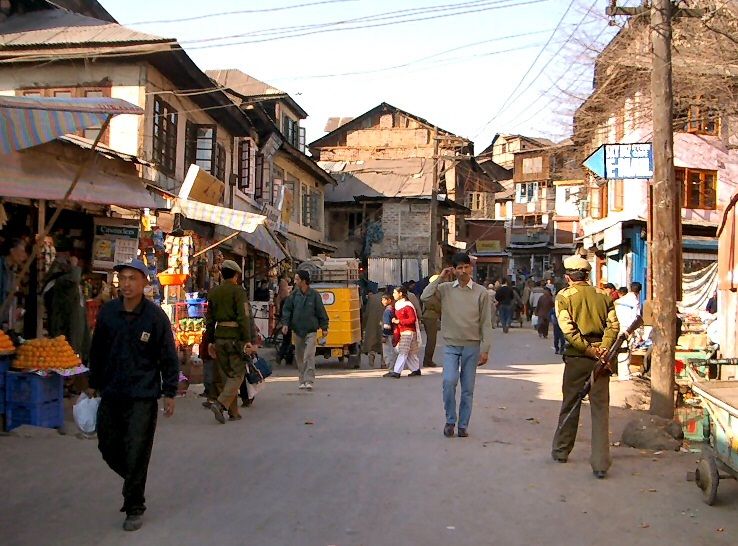 It has suffered from ongoing political and terrorist unrest with the local police and army often coming under attack from Kashmiri separatists. The managing director of the events sponsor (TCI Freight), Umer Tramboo summed up the power an event like a marathon can have in the region, telling the local paper “We need to organise more such events. In our State youth have taken to lot of social evils, like drug abuse and it is only events like this that can take them away from these evils”. The course in took much of the 2,300 year old city but the highlight would have been running the 15 kilometres/9.6 miles around the city’s biggest lake. While the race started in -2 (C)/(28 (F), the temperature in the mountainous region reaches highs in the mid-teens (C)/ 60’s (F). However if the race was held in a month’s time they would have been able to run on the Dal lake, as arctic wintry conditions means the lake freezes over. Given that I normally only hear of Kashmir in the news in relation to violence and conflict, I felt obligated to try and promote some good news from the region. Congratulations to Reyaz Ahmad, all entrants and event organisers for holding and completing the inaugural Srinagar marathon. Have you heard of any marathons in unique or interesting parts of the world that you think deserve recognition? US Republican vice-president nominee Paul Ryan made headlines earlier this year when he exaggerated his marathon PB by more than an hour, claiming to have run sub-3 hours for the 26.2 miles. He got caught out though and later revealed his best time was in fact 4:01:25 for the 1990 Grandma’s Marathon. It seems as though marathon scams are not unique just to the US though, with 2006 Mexican President nominee Roberto Madrazo having a scandal of his own in the 2007 Berlin Marathon. Madrazo recorded a blistering 2:41:12 and was overall winner for the over 55 year age group. However with the evidence of data tracking and two missed timing points, Madrazo was revealed as a cheat. Jimmy Carter, the 39th US President never ran a marathon but was an avid runner. He is quoted as saying “Everyone who has run knows that its most important value is in removing tension and allowing a release from whatever other cares the day may bring”. During his presidency he regularly ran five miles (at 7:30 mile pace!) and created headlines by collaping in his first road race in the Catoctin Mountains in September, 1979. 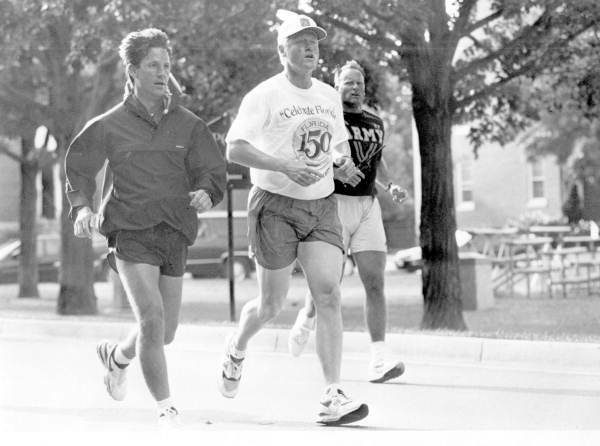 42nd US President Bill Clinton was also an avid runner, causing headaches for his security detail by wanting to run on unplanned routes in public. And while Ronald Reagan was not a runner himself, there is a half marathon event that bears his name – though mainly due to the fact it is held on the Reagan Parkway as opposed to any link to Reagan himself! 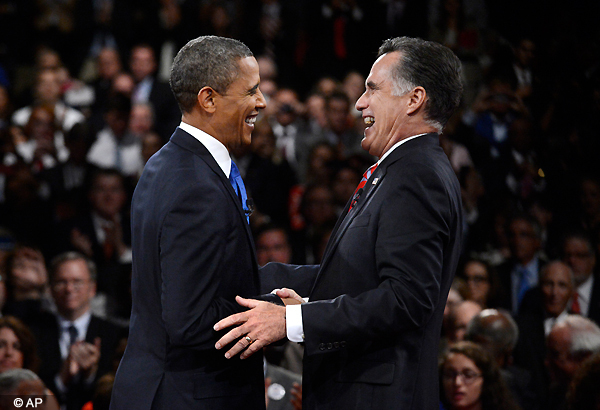 Both current nominees, incumbent Barack Obama and Republican Mitt Romney are perceived as fit although neither have run a marathon, but Romney has a resting heart rate that most marathoners would be proud of – 40 beats per minute, which his doctor attributes to “past intensive exercise with regular running“. There are many other world leaders and politicians that have also completed the marathon distance but I’ll limit this to US presidents given that is what the election is all about. I still think I’d rather be running as opposed to running for office, but the evidence shows the two are more closely linked than would first appear.